Dozens of people gathered this morning to clean one of the beaches in Kissamos area that was most affected by the tide of rubbish that came down the rivers with this winter’s storms. 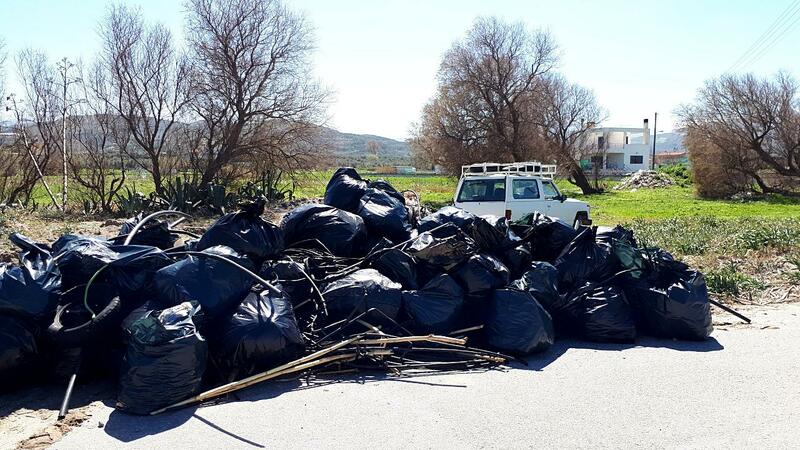 Members of the Kissamos Clean Beaches team, people from Drapanias village, local business owners, citizens of Kissamos, students from the local high school all joined in the effort to collect as much rubbish as possible along Drapanias beach. We also had the support of two tractors gathering the heavy bags, rubbish bags and gloves supplied by the Municipality of Kissamos and by local businesses. In the end, we had a mountain of rubbish, and we used up more than 100 big bin bags collected by an estimated 80+ people! The beach is still covered with natural bamboo sticks, but all the visible rubbish was taken away for a long stretch, about 1km long. Everyone is increasingly aware of the issues that come with all the waste we produce, and the great turn up this morning is there to show it.